Kidney cancer, also known as renal cancer, is a type of cancer that starts in the cells in the kidney. 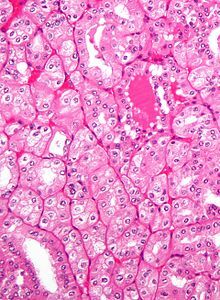 Micrograph showing the most common type of kidney cancer (clear cell renal cell carcinoma). H&E stain. The two most common types of kidney cancer are renal cell carcinoma (RCC) and transitional cell carcinoma (TCC) (also known as urothelial cell carcinoma) of the renal pelvis. These names reflect the type of cell from which the cancer developed. The different types of kidney cancer (such as RCC and TCC) develop in different ways, meaning that the diseases have different long term outcomes, and need to be staged and treated in different ways. RCC is responsible for approximately 80% of primary renal cancers, and TCC accounts for the majority of the remainder. Overall five year survival rate in the United States is 73%. For cancers that are confined to the kidney, the five year survival rate is 92%, if it has spread to the surrounding lymph nodes it is 65%, and if it has metastasized, it is 12%. The most common signs and symptoms of kidney cancer are a mass in the abdomen and/or blood in the urine (or hematuria). Other symptoms may include tiredness, loss of appetite, weight loss, a high temperature and heavy sweating, and persistent pain in the abdomen, especially in the early stages of the disease. Factors that increase the risk of kidney cancer include smoking, which can double the risk of the disease; obesity; faulty genes; a family history of kidney cancer; having kidney disease that needs dialysis; being infected with hepatitis C; and previous treatment for testicular cancer or cervical cancer. There are also other possible risk factors such as kidney stones and high blood pressure, which are being investigated. Some studies have linked regular use of NSAIDs such as ibuprofen and naproxen to increases of kidney cancer risk by up to 51%, but other research shows no such connection at least with regards to renal cell cancers. Kidney cancer originates in the kidney in two principal locations: the renal tubule and the renal pelvis. Most cancers in the renal tubule are renal cell carcinoma and clear cell adenocarcinoma. Most cancers in the renal pelvis are transitional cell carcinoma. Micrograph of a kidney cancer (chromophobe renal cell carcinoma, oncocytic variant), that may be challenging to differentiate from a benign kidney tumour (renal oncocytoma). H&E stain. Micrograph of papillary renal cell carcinoma, a form of kidney cancer. H&E stain. Wilms' tumor, usually is reported in children under the age of 5. Cancer in the kidney may also be secondary, the result of metastasis from a primary cancer elsewhere in the body. For stage 4 kidney cancer, the most common sites kidney cancer metastasis are the lungs, bones, liver, brain, and distant lymph nodes. Treatment for kidney cancer depends on the type and stage of the disease. Surgery is the most common treatment as kidney cancer does not often respond to chemotherapy and radiotherapy. Surgical complexity can be estimated by the RENAL Nephrometry Scoring System. If the cancer has not spread it will usually be removed by surgery. In some cases this involves removing the whole kidney however most tumors are amenable to partial removal to eradicate the tumor and preserve the remaining normal portion of the kidney. Surgery is not always possible – for example the patient may have other medical conditions that prevent it, or the cancer may have spread around the body and doctors may not be able to remove it. There is currently no evidence that body-wide medical therapy after surgery where there is no known residual disease, that is, adjuvant therapy, helps to improve survival in kidney cancer. If the cancer cannot be treated with surgery other techniques such as freezing the tumour or treating it with high temperatures may be used. However these are not yet used as standard treatments for kidney cancer. Other treatment options include biological therapies such as everolimus, torisel, nexavar, sutent, and axitinib, the use of immunotherapy including interferon and interleukin-2. Immunotherapy is successful in 10 to 15% of people. Sunitinib is the current standard of care in the adjuvant setting along with pazopanib; these treatments are often followed by everolimus, axitinib, and sorafenib. Immune checkpoint inhibitors are also in trials for kidney cancer, and some have gained approval for medical use. In the second line setting, nivolumab demonstrated an overall survival advantage in advanced clear renal cell carcinoma over everolimus in 2015 and was approved by the FDA. Cabozantinib also demonstrated an overall survival benefit over everolimus and was approved by the FDA as a second-line treatment in 2016. Lenvatinib in combination with everolimus was approved in 2016 for patients who have had exactly one prior line of angiogenic therapy. In Wilms' tumor, chemotherapy, radiotherapy and surgery are the accepted treatments, depending on the stage of the disease when it is diagnosed. The majority of kidney cancers reported in children are Wilms' tumors. These tumors can begin to grow when a fetus is still developing in the uterus, and may not cause problems until the child is a few years old. Wilms' tumor is most common in children under the age of 5, but can rarely be diagnosed in older children or in adults. It is still not clear what causes most Wilms' tumors. The most common symptoms are swelling of the abdomen and blood in the urine. Around 208,500 new cases of kidney cancer are diagnosed in the world each year, accounting for just under 2% of all cancers. The highest rates are recorded in North America and the lowest rates in Asia and Africa. The United States' NIH estimates for 2013 around 64,770 new cases of kidney cancer and 13,570 deaths from the disease. The incidence of kidney cancer is also increasing in the United States. This is thought to be a real increase, not only due to changes in the way the disease is diagnosed. The most recent estimates of incidence of kidney cancer suggest that there are 63,300 new cases annually in the EU25. In Europe, kidney cancer accounts for nearly 3% of all cancer cases. Kidney cancer is the eighth most common cancer in the UK (around 10,100 people were diagnosed with the disease in 2011), and it is the fourteenth most common cause of cancer death (around 4,300 people died in 2012). ^ a b "SEER Stat Fact Sheets: Kidney and Renal Pelvis Cancer". NCI. Retrieved 31 March 2016. ^ "Symptoms of kidney cancer". ^ Katie Charles (January 19, 2011). "Kidney cancer: Innovative new treatments boost survival rates for cancer patients: Daily Checkup with Michael Palese". New York Daily News. Retrieved February 23, 2011. ^ Cheungpasitporn, W; Thongprayoon C; O'Corragain OA; Edmonds PJ; Ungprasert P; Kittanamongkolchai W; Erickson SB (9 September 2014). "The Risk of Kidney Cancer in Patients with Kidney Stones: A Systematic Review and Meta-analysis". QJM. 108: 205–12. doi:10.1093/qjmed/hcu195. PMID 25208892. ^ "Risks and causes of kidney cancer". ^ "Commonly Used Pain Pills Increase Kidney Cancer Risk in Study". Bloomberg. ^ Lipworth, Loren; Robert E. Tarone; Joseph K McLaughlin (13 December 2005). "The Epidemiology of Renal Cell Carcinoma". Journal of Urology. 176 (6): 2353–235. doi:10.1016/j.juro.2006.07.130. PMID 17085101. Retrieved 2012-07-15. ^ Thyavihally YB, Tongaonkar HB, Desai SB (September 2005). "Benign mixed epithelial stromal tumor of the renal pelvis with exophytic growth: case report". Int Semin Surg Oncol. 2: 18. doi:10.1186/1477-7800-2-18. PMC 1215508. PMID 16150156. ^ Nzegwu MA, Aligbe JU, Akintomide GS, Akhigbe AO (May 2007). "Mature cystic renal teratoma in a 25-year-old woman with ipsilateral hydronephrosis, urinary tract infection and spontaneous abortion". Eur J Cancer Care (Engl). 16 (3): 300–2. doi:10.1111/j.1365-2354.2006.00755.x. PMID 17508953. Archived from the original on 2013-01-05. ^ Chiu, KC; Lin, MC; Liang, YC; Chen, CY (2008). "Renal carcinosarcoma: case report and review of literature". Renal failure. 30 (10): 1034–9. doi:10.1080/08860220802403192. PMID 19016157. ^ Kuroda N, Katto K, Tamura M, Shiotsu T, Hes O, Michal M, Nagashima Y, Ohara M, Hirouchi T, Mizuno K, Hayashi Y, Lee GH (January 2008). 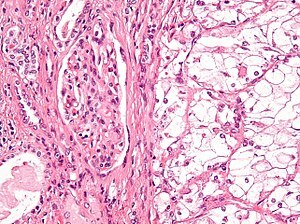 "Carcinoid tumor of the renal pelvis: consideration on the histogenesis". Pathol. Int. 58 (1): 51–4. doi:10.1111/j.1440-1827.2007.02188.x. PMID 18067641. Archived from the original on 2013-01-05. ^ "Early stage and locally advanced kidney cancer treatment". ^ "National Comprehensive Cancer Network" (PDF). ^ "Biological therapy for kidney cancer". ^ Jonasch, Eric; Messner, Carolyn (August 2012). "CancerCare Connect – Treatment Update: Kidney Cancer" (PDF). Cancer Care, Inc. Archived from the original (PDF) on 2011-09-25. Retrieved 2012-08-29. ^ a b Syn, Nicholas L; Teng, Michele W L; Mok, Tony S K; Soo, Ross A. "De-novo and acquired resistance to immune checkpoint targeting". The Lancet Oncology. 18 (12): e731–e741. doi:10.1016/s1470-2045(17)30607-1. ^ "FDA approves Opdivo to treat advanced form of kidney cancer". ^ Philips, GK; Atkins, MB (2014). "New agents and new targets for renal cell carcinoma". American Society of Clinical Oncology educational book / ASCO. American Society of Clinical Oncology. Meeting. 34: e222–7. doi:10.14694/EdBook_AM.2014.34.e222. PMID 24857106. ^ a b "Wilms' tumour (kidney cancer in children)". Archived from the original on 2012-04-06. ^ "Cancer of the Kidney and Renal Pelvis – SEER Stat Fact Sheets". National Cancer Institute, U.S. National Institutes of Health. Retrieved 2013-02-07. ^ Lynch, Charles F.; West, Michele M.; Davila, Jessica A.; Platz, Charles E. (2007). "Chapter 24: Cancers of the Kidney and Renal Pelvic". In Ries, LAG; Young, JL; Keel, GE; Eisner, MP; Horner, M-J (eds.). SEER Survival Monograph: Cancer Survival Among Adults: US SEER Program, 1988–2001, Patient and Tumor Characteristics. SEER Program. NIH Pub. No. 07-6215. Bethesda, MD: National Cancer Institute. pp. 193–202. Archived from the original on 2013-10-10. ^ Ferlay J, et al. (2007). "Estimates of the cancer incidence and mortality in Europe in 2006". Annals of Oncology. 18 (3): 581–92. doi:10.1093/annonc/mdl498. PMID 17287242. ^ "Kidney cancer statistics". Cancer Research UK. Retrieved 27 October 2014. "U.S. NIH – Cancer of the Kidney and Renal Pelvis – Statistics".